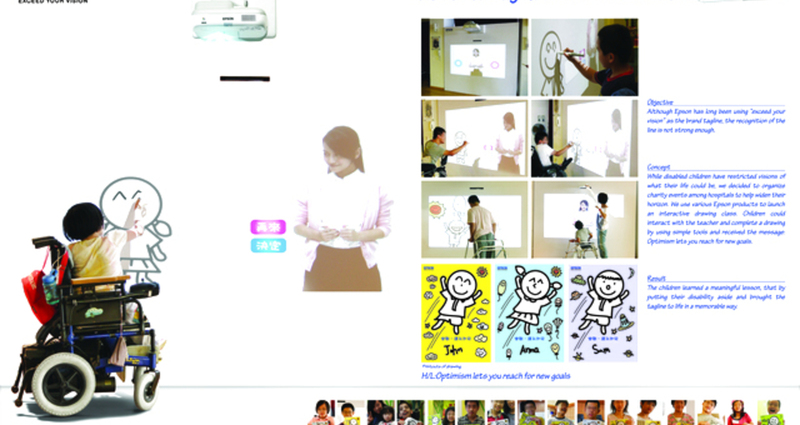 Cyber Drawing Class / EPSON Hong Kong Ltd.
We launched a corporate social program as a branding experience intending to demonstrate how Epson’s products help people to exceed their vision in real life. Disabled children, especially those with muscular dystrophy, have very restricted visions of what their life could be. We organised charity events to widen their horizon. We created a mobile booth to go among hospitals with disabled kids. Using various Epson products, including interactive projector with video and programming, we launched an interactive drawing class. Children could interact with virtual teacher, draw with simple tools, experience lots of interesting things, and receive the printout with the message “Optimism lets you reach for new goals”. Although Epson has long been using “exceed your vision” as the brand tagline, its recognition and appreciation of what it means are not strong enough. We wanted to bring the tagline to life in a memorable way. Since the drawing classes were held for disabled children with muscular dystrophy, the major technical challenge was to ensure the softwares and hardware involved were user-friendly enough for them. Adjustments of the classes’ easiness were made several times, in order to accommodate the disabled and maintain their interest, while communicating the message ““Optimism lets you reach for new goals” effectively.